Here at Aubrey and Finn, like other Estate Agents you may meet, we love to help our clients buy, sell and rent their homes. However, we also like to recognise that we are a little different to other estate agents you may visit in the St Albans and Hemel Hempstead areas. 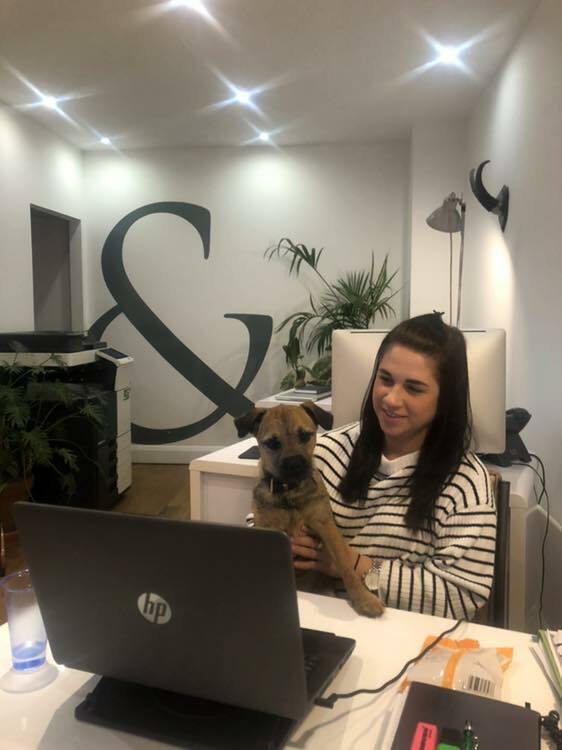 Our premises have a unique, relaxed, café-style feel, there’s often music playing in the background and our resident doggy mascot Cricket, can often be found greeting our customers as they enter. Whilst we love our business set-up, we also recognise that we not everyone’s cup of tea and that’s okay! Perhaps we look a little too fresh-faced, or we don’t give off a corporate enough feel for an our industry, but as a business, we’re “doing” Estate Agency the way that we think works for us, and this will attract the kind of clients and customers who think we would be a good fit for them. We know that selling or renting out your property can be a very emotional and sometimes stressful time, and our clients rely on us to make the process go as smoothly as possible for them. That’s why it’s really important to be able to feel confident and trust in the abilities of your estate agent to be able to secure a successful sale or rental and a hassle-free completion to your transaction. 1. What’s the best price you think is obtainable for my property and is this in-line with the local market picture? Let’s face it; everyone normally wants the best possible price for their property, so it can be very tempting when an agent gives you an attractive proposition of what price they could secure for your property. However, this needs to be in-line with the market average, and shouldn’t be the deciding factor of who to place your property on the market with. You can also do your own research on portal websites to see what properties have been recently sold and rented for in your area. 2. What is your Fee/Commission Structure? As with the previous question, it’s not always advisable to choose your Estate Agent purely on a cost basis, but understanding the fees or commission structure which your estate agent charges is essential, so that you can work out your finances and consider the right agent to sell or rent your home, which works for you and your budget. 3. How big is your team and who will be showing my property to prospective buyers/renters? It’s important to understand who your prospective buyers or renters will be meeting when they come to your home or property. Will it be the business owner or manager? Will it be the sales or lettings specialist? Will it be someone who is part-time and works remotely, a Saturday person, or will you be expected to show the property yourself? Knowing who will be showing your property and more importantly, how well they will know your property, the area it is situated in and the circumstances behind the sale are so important. In bigger agencies, with lots of properties on their books, it may be that the person the Estate Agent sends never visits the same property twice, or is unfamiliar with the quirks or layout your property has. 4. How long are properties on the market with you on average? Some properties are so attractive perhaps due to location, price or school catchment area that they quite literally fly off the shelf, and we often help to create a demand around them to get the best possible price or rental situation for them. Others may be wonderful, but just not what the consumer is looking for at the moment and can take a little longer to sell or rent, but it’s what the estate agent is doing to help the process along which is important. Estate agents should be able to tell you the stats on their average sale or rental, and also the qualitative information around those stats too. 5. What’s your knowledge of the local area like? Your estate agent often needs to be able to answer the myriad of questions about the area your property is situated in including the local property market picture, transport links, school catchment areas, parking situation for the property, whether the property is leasehold/freehold, and many more, so it’s important that you feel confident in their abilities to be able to answer these questions. 6. What communication methods do you use? The way that your Estate Agent communicates should be in-line with how you communicate. Do you know that we still know some estate agents and solicitors who will ONLY communicate by letter? Finding out how you can communicate with your estate agent, whether you will have one central point of contact, when they are available and how you can get through to them (phone/email/text) is very important for a smooth communication process. Find out how you can interact with your estate during the transaction. Will you have one point of contact? Can you reach them via email or do you need to call them? What hours are they available? Do they offer a 24 hour service for any rental issues? This may determine who the best Estate Agents will be for you. 7. How long am I tied into my contract for, what’s the cooling off period, and what are the penalties for moving to another agency? This question is a really important one to ask as it’s crucial to know, if things go downhill with your agent, how long it will be before you can get out of your agreement if things aren’t working. All too often, we have people come to us when things aren’t working with other agents, and we are unable to help them, because they are locked into such watertight contracts, which mean that they will incur huge penalties if they instruct us to market their property, so it’s essential to know how long it will be before you can get out of the contract you have committed to if you need to, and also what the cancellation period is, if you quickly realise that things aren’t working in the early days of instruction. 8. How will my property be marketed? Take a look at the way that your prospective estate agent is currently marketing other properties. Most agents worth their salt will place your property onto portal sites like Rightmove, but what else are they doing? Are they taking photos which portray your home in the best light, are they sending out your property’s details to their database, are they including it in printed literature or marketing it on social media? What are the other methods they will use? Are these in-line with who you think would be a great buyer or rentor? 9. Who are you regulated by? How can you prove great customer service? This brings in the trust element of your transaction. Who can you contact if things go wrong? Does the estate agent subscribe to a regulator? Does the estate agency have credible customer testimonials you can view online, or have they won any awards which are testament to their credibility within the industry? Your estate agent should be able to give you examples of regulatory bodies, happy customers and great customer service to help you to make your decision. 10. Are there any other options that you think would work for our situation? When considering how to make an income out of your property, it can sometimes pay to think outside of the box! We are the only agent in St Albans and Hemel offering our Airbnb management service, which can often bring in 30% more per year than a rental income and retains the property for you to use when you want to. If you may still want to live in your property, or perhaps keep it for its location, then we can help you to consider whether other options may work – such as retaining your family home and getting a second mortgage to rent another property, or renting your property out through Airbnb so that you can still live in it. Always ask your agent whether they think that the option you are pursuing is the best one for your situation. Ultimately, asking the questions above (and these aren’t exhaustive) should enable you to gain enough information to build up a good picture of the Estate Agents who will best be a good fit for you, and your property, taking into account your preferred communication methods, values and beliefs and also importantly, your budget too. Of course we would love to be the Agents to help you or your friends and family to sell or rent property locally, so if you are thinking of selling or renting out your property either in the short or longer term and would be interested in a free, no obligation quote, then please do get in touch with us at the office. We can also offer local free advice on the property market, so even if it’s just a question you have, please do feel free to pick up the phone or pop in and see us!